In Guatemala a 36-year guerrilla war which formally ended in 1996 and ongoing drug cartel and gang violence has left over 200,000 people dead and created an estimated 1 million refugees in Guatemala. The country struggles with poverty, infant, child, and maternal mortality, malnutrition, proper sanitation, and contraceptive awareness and use. The female literacy rate is surprisingly only 76%. More than half of the population is below the national poverty line, and 23% of the population lives in extreme poverty. Poverty among indigenous groups, which make up more than 40% of the population, averages 79%, with 40% of the indigenous population living in extreme poverty. Nearly one-half of Guatemala’s children under age five are chronically malnourished, one of the highest malnutrition rates in the world. These areas have also been ravaged by climate change, natural disasters, droughts, flooding, and mud slides. Friendship Bridge, a microfinance company focuses on helping these poverty stricken communities from the inside out by empowering women to build a better life for themselves and their families through small loans to start and grown their own sustainable businesses, practical education and training, and health services. Friendship Bridge believes in a hand up, not a hand out. Your donation isn’t charity, but rather supports long-term, sustainable solutions to poverty. 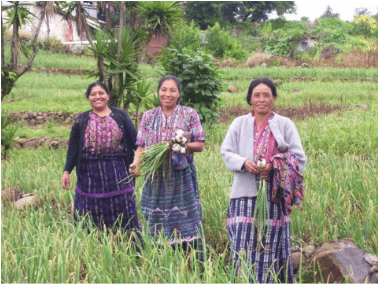 You’re giving a gift of a better life and empowerment for women in Guatemala!